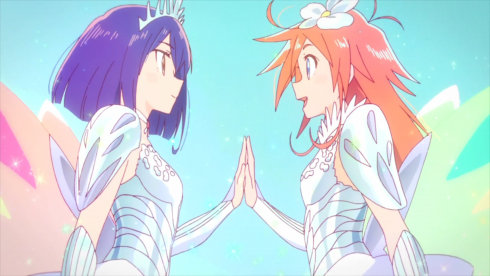 In typically explosive, surreal, and dynamically animated fashion, Flip Flappers delivers a penultimate episode that puts a capstone on our main character arcs and gives us plenty of time next week to tie up the rest of the loose ends. While “Pure Howling” sometimes loses focus as it jerks from scene-to-scene, trying to weave multiple stories together very quickly, it more than makes up for any disjointedness with two beautifully staged and immensely satisfying emotional climaxes. Any week I get to write “MY HEART!” in my notes is a good one in my book. We’ve spent much of the last few episodes diving into the past, which has benefited the plot and some thematic through-lines but hasn’t been quite as good in terms of emotional investment. 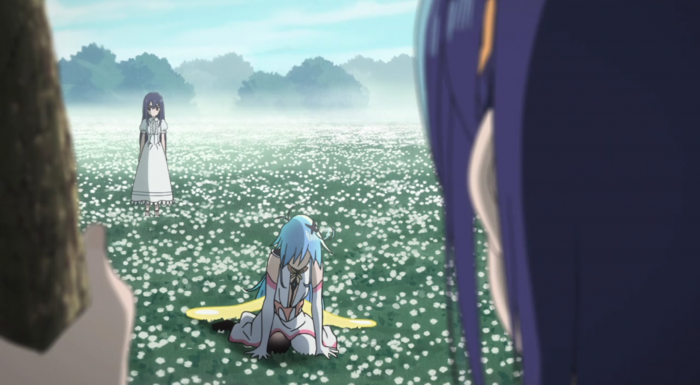 Flip Flappers is at its best when focusing on its three main girls (both as individuals and in their relationships with each other), and despite some asides with the rest of cast and Mimi’s integral role in the final scenes, this week very much returned us to our central trio and their journeys into adulthood. 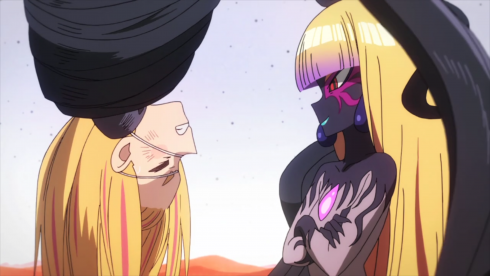 It seems like I never get a chance to spend any time with Yayaka, so let’s start with that, because her encounter with the Queen of Masks might’ve been the strongest scene of the episode (and this is an episode that featured Magical Girl Wedding Armor, for heaven’s sake). 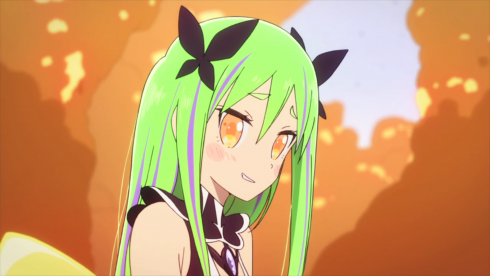 The Queen lays bare Yayaka’s insecurities just as she did Cocona’s way back in Episode 3, hitting on Yayaka’s fear of abandonment, of being useless and losing her place in the world. Fortunately, Yayaka is further along her personal journey than Cocona was, so she fights back (“shut up”) with little hesitation. Still, it’s not enough just to silence the voice telling her to give in to fear and despair. Yayaka also needs to be honest with herself, to openly acknowledge the things she does care about–the things that are worth fighting for. She’s never been able to do that before, always hiding her feelings, insisting she has a “different mindset” than Cocona and Papika. We’ve known since they all synchronized in the mecha that this wasn’t true, but Yayaka still wasn’t willing to admit it. 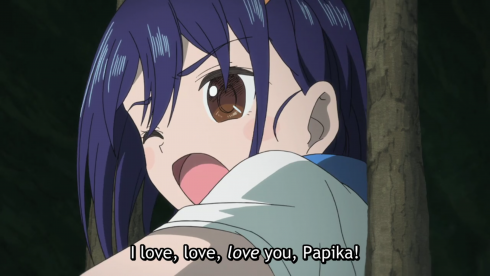 This week, though (with some encouragement from Papika), Yayaka finally says what we at home have always known: That her feelings for Cocona are genuine, that the place where she’s happiest–where she wants to be–is right beside her friend, and that she has to apologize even if Cocona won’t forgive her, because Cocona is Yayaka’s “treasure.” And, in true magical girl fashion, that raw emotional honesty combines with Mimi’s fragment to give Yayaka the power she needs to defeat the temptress. Speaking of that fragment (and expanding on what we talked about last week), Mimi continues to be a fascinating figure, one fragment of her personality helping Yayaka even as another lashes out at her. She is the best and worst of adult figures, simultaneously seeking to control and mold the younger generation into her image while also trying to empower and encourage them, to give them the tools they need to make their own choices and walk their own paths. More specifically, she’s the two extreme paths so often taken by people who have been abused and/or controlled during childhood. A part of her wants to fight to give others the freedom she was denied, while another part of her falls into the patterns she learned growing up–to do unto others as others had done unto her, in essence. There’s something faintly feminist about all this, too, given the stereotypically feminine room Mimi had as a child, the lack of female authority figures at the institute, and the simple fact that women have traditionally been denied power and agency. Mimi, then, is possibility: the woman who gives in to the status quo, believing other young women can’t be trusted to make their own choices either; the woman who rages at her cage, lashing out at the world that wronged her and everyone who challenges her; and the woman who nurtures change, seeking to build a better future by giving her daughter the freedom she never had. All of which feeds into Cocona’s and Papika’s individual climaxes, as Mimi plays an integral role in both girls’ stories this week. 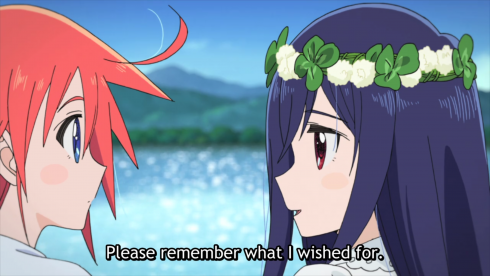 Flip Flappers has done such an excellent job building Cocona’s character and laying the groundwork for this conclusion that there’s not a ton for me to say about it. 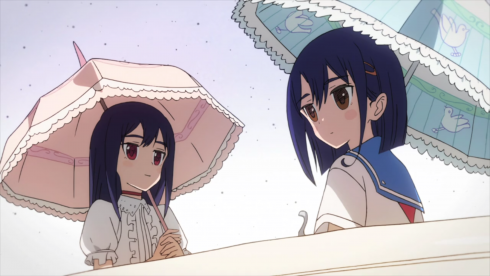 Her conversation with her mother (likely the fragment embedded in Cocona herself) is beautiful in its simplicity, and no less profound. It speaks to Cocona’s specific fears as well as the general concerns of adulthood–“Can I make my own choices? What if they’re the wrong ones?”–and assures both Cocona and its YA audience that these fears are okay and normal. “Everybody’s like that,” after all. 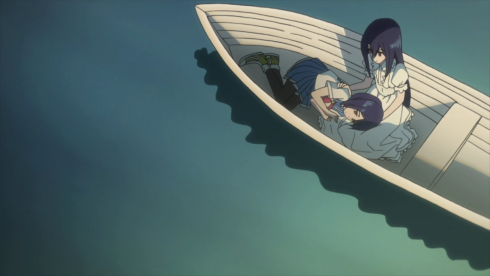 Cocona’s mother never tells her what to do here. She doesn’t say “break free” or “go help your friends.” She just assures her of her worth, promises her that she can make her own choices, and steps aside, letting Cocona do exactly that. 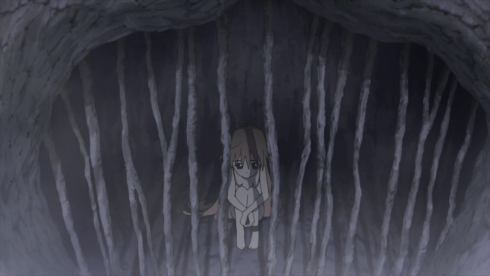 Cocona watched her friends fight for her but still stayed caged and obedient, trapped in a prison of her own fears. With her mother giving her that final piece of confidence, though, she never hesitates. She calls out to Papika and finally gives voice to her own feelings of “love, love, love” for her partner. With the two in perfect sync, they don’t even need Mimi’s fragments to transform anymore. They can wield power on their own now. Papika’s arc has always been the toughest to follow thanks to her jumbled memories, but I think what we’re seeing here is the culmination of her journey towards empathy and consideration. While Cocona’s been struggling with desire and personal identity in the story’s foreground, Papika has been in the background struggling with how to interact with others–to be a supportive partner or friend to the people she cares about. 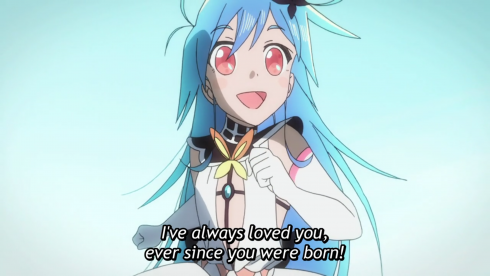 Through trial and error, Papika has shifted from always doing whatever she wants, to blindly guessing at what Cocona wants, to actually communicating with and supporting Cocona. 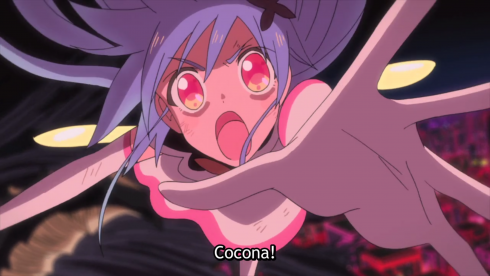 When she fights with Mimi, she doesn’t say she wants Cocona back for herself, but that she wants Mimi to acknowledge Cocona as her own person who has “places she holds dear.” Papika isn’t fighting for any specific future, but for Cocona to be able to choose that future on her own. That she’s doing this for both Cocona and the Mimi of her memories makes it an even more loving and selfless act than it already was. Papika’s battle in this finale isn’t a personal one. It’s defined by her relationships and promises to loved ones. Normally I might take issue with that, but in this case, it’s perfect. Papika has never had trouble acting on her own desires, after all. It’s doing the same for others that’s been her problem. Just as Cocona needed to learn how to fight for herself, Papika needed to learn how to fight for someone else. I’d say she does so splendidly here. Meanwhile, the people around our central characters are feeling the ripple effects of their actions. 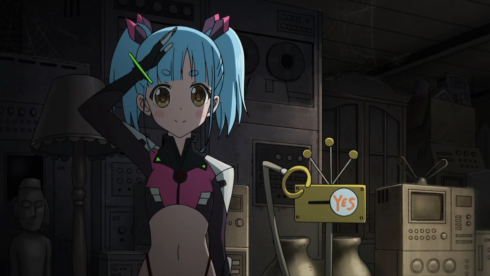 Dr. Salt goes with Sayuri, Bu-chan, and Nyunyu to seek out “Asclepius’s Box,” a.k.a. 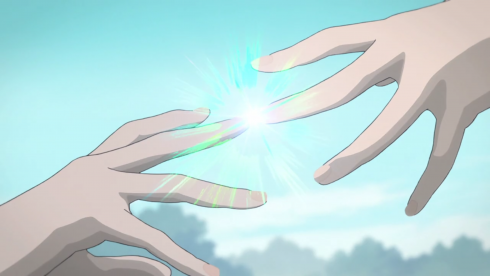 ELPIS, the hope that remains even after evil escapes into the world. Elsewhere, Yuyu puts her twin’s life before the mission and begins her own rebellious phase. 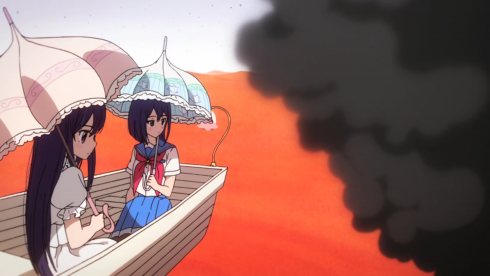 With the exception of Salt, these subplots and mini-arcs feel a bit last-minute and tacked-on, but Flip Flappers has earned my trust so I’ll withhold judgment until the finale. If nothing else, I am starting to get a feel for how the amorphous kids fit into the story. As children, they really are “amorphous.” Ill-defined and lacking a clear focus, they initially take on the mindset and desires of those around them. Toto and Yuyu followed Asclepius without hesitation. Nyunyu is doing the same with FlipFlap, who have all but adopted her at this point. However, as children grow, they start to cobble their experiences, needs, and wants together into a unique, individual shape. 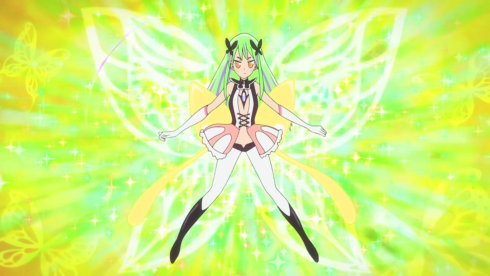 Influenced by Yayaka and concerned for her brother, Yuyu tells Asclepius to piss off. Like Cocona, Papika, and Yayaka, we can’t say Yuyu is amorphous anymore. 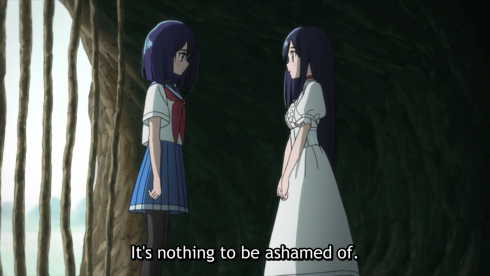 This, I think, feeds not just into Flip Flappers’s grand metaphor for adolescence, but also its encouragement of freedom and choice. We’ve been calling them “the amorphous children,” but this was a name given to them by a mad scientist who wanted to wield a woman like a weapon. So maybe we shouldn’t take that name as fact, but rather as another control tactic. Just as Asclepius threatened Yayaka with abandonment, they slapped Yuyu, Toto, and Nyunyu with a false label to make them believe they lacked individuality and keep them obedient to the cause. 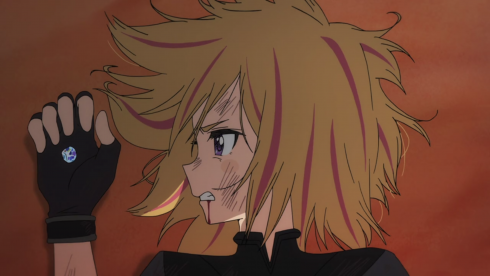 It’s a small moment, but Yuyu disobeying Asclepius is a huge step forward for her, and just one more example of the gals in Flip Flappers fighting back against the authority figures who seek to control them. You break those cage bars, ladies. You break them right proper. Not gonna lie: Watching Yuri on Ice and Flip Flappers compete to be the gayest show of the season has been the highlight of the Fall for me. More queer representation in anime, please and thank you! Nyunyu is about as superfluous to the narrative as Bu-chan and arguably just as problematic…so it’s actually kinda cute that they’re besties now? Sorry, but if you’re here seeking an explanation of Bu’s (underwhelming) Muscle Bod or why it’s called “Idiom Mode,” you’re gonna have to look elsewhere, ’cause I don’t have a good answer for ya. Pure Speculation: That brief scene of Papika in a cage and speaking to a young Mimi (or is that Cocona?) sure feels like important backstory. Maybe Papika was trapped in Pure Illusion at the same time Mimi became fragments, and this child helped free her? And if this child is Cocona, could that explain Papika’s immediate attachment to her? I know we only have one episode left, but I’d love to fill in just a few more blanks before we go.